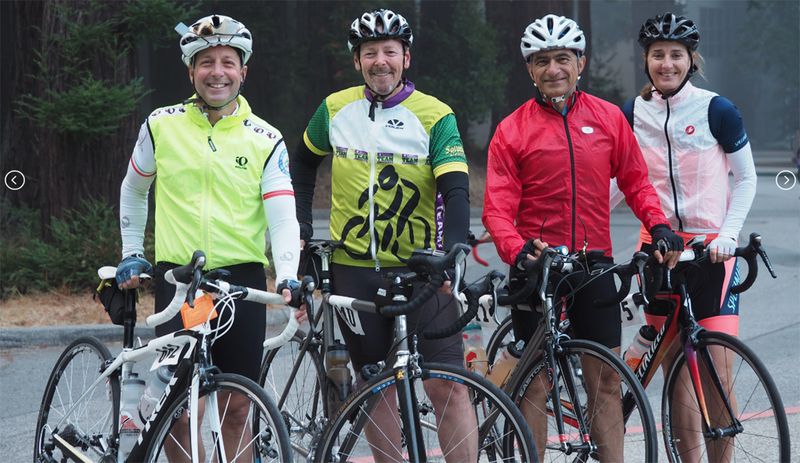 The Santa Cruz Mountains Challenge (SCMC) is the main fundraiser for the Santa Cruz County Cycling Club (SCCCC). The club provides grants to local non-profits that support cycling and health, and is staffed entirely by members and other volunteers. This year, SCCCC celebrates the 20th year of its popular road cycling event that offers four distinct routes through the scenic Santa Cruz mountains and along the coast. Route choices include: 45-mile / 2,900′ of climbing; 75-mile / 6,800′ of climbing; 101-mile / 10,100′ of climbing, or the crown jewel ride — a 135-miler with 13,200′ of lung busting climbing. Riders ascend through soaring redwoods, descend along scenic meadows, and pedal along roads on the Monterey Bay to the sound of crashing surf. This route offers some of the best ocean views Santa Cruz has to offer. At 45.3 miles with 2,959′ of climbing, it works out to a leisurely 46 FPM. Riders should start between 9:00 – 10:00 am. This route is suitable for most levels of cyclists who enjoy hills. This route offers many of the scenic roads from the 135M and 101M rides. This 75.7 mile route is no slouch of a ride, with 6,794′ of climbing or 90 FPM. Riders must start by 8:00 am. This route is suitable for experienced cyclists. Not quite tuned up for the 135M? The 101.6 mile route is the ticket. At 10,130′ of climbing, it offers excellent bragging rights at 100 FPM. Riders should start by 7:30 am and clear the Lunch Stop by 1:30 pm or take the 75M route back as there may not be sufficient time to complete the 101M route. This route is suitable for experienced cyclists. The 135 Mile ride is the crown jewel of the SCMC. With 135.0 miles and 13,215′ of climbing, this route comes close to the Death Ride in elevation. More climbing bang for your buck at 98 Feet Per Mile (FPM)! Riders should start by 7:00 am and clear the Lunch Stop by 1:00 pm, or return via the 100M route, as there will not be sufficient time to complete the 135M route. Due to the amount of mileage and elevation gain, this course is only suitable for experienced cyclists with a very strong fitness foundation. Learn more and register at santacruzmountainschallenge.com. The Santa Cruz Mountains Challenge is a function of the Santa Cruz County Cycling Club (SCCCC). Proceeds from the event go to their Grants Program which supports local cycling related programs. Recent recipients of that grant program have been the Bike Church Santa Cruz, UCSC Recreation Bike Maintenance, Harbor High School Mountain Bike Team, Open Streets Santa Cruz, Trips for Kids and Ecology Action Youth Bike Smart Program.